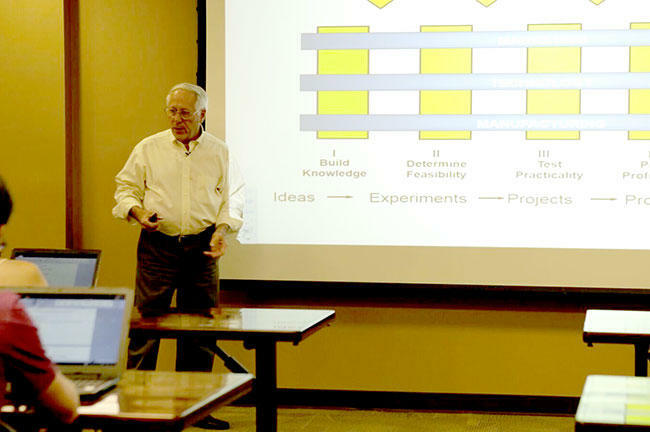 Former Corning Incorporated researcher and executive Donald Keck talks to the USF Honors College course called "Get Innovative" about how he helped develop optical fiber strong enough to support the internet. Extended University Beat report on the Institute for Advanced Discovery and Innovation and the "Get Innovative" course. 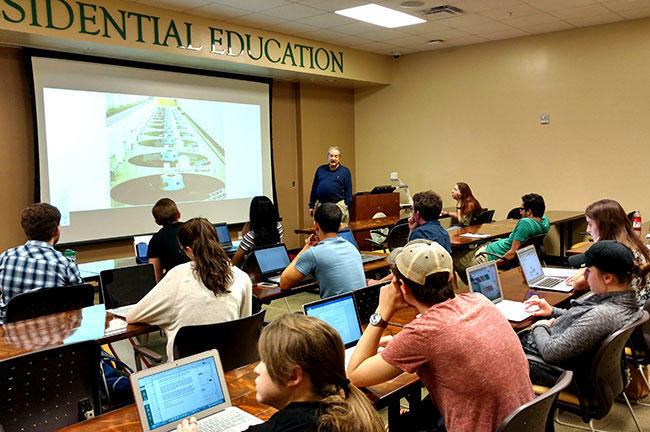 The University of South Florida is 61 years old – and believe it or not, that’s pretty young compared to many of the premier research universities that USF wants to be in the company of. Universities also like to get successful alumni to share their stories with faculty and students, and USF’s age makes that a bit of challenge. So, USF Senior Vice President for Research and Innovation Paul Sanberg reasoned, why not create an institute that taps into the pool of talent whose careers have recently ended? "This was a way to kind of kick start it," Sanberg said. "Hey, we’re in Florida, there’s a lot of great people out there that are retiring in Florida, why aren’t we taking advantage of that?" 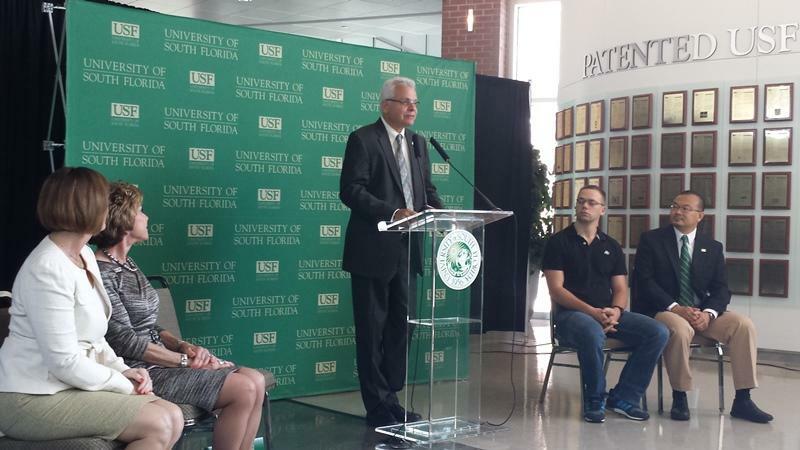 As a result, USF created the Institute for Advanced Discovery and Innovation. In a short period of time, it’s brought in about twenty homegrown and retired experts from across science, engineering, education, business and health. Their mission? 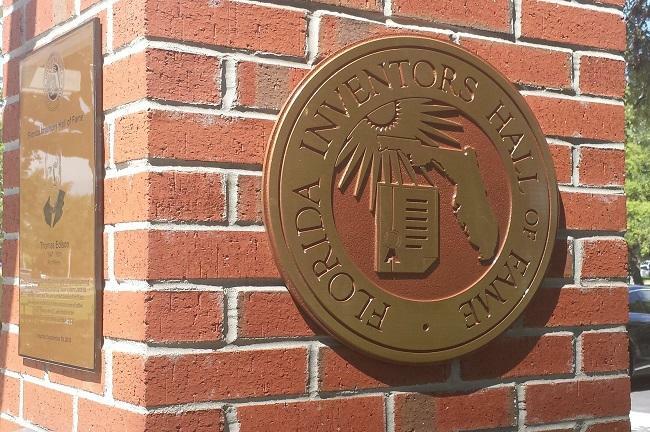 Teach the USF community what it means to be innovative. "So we started this Institute really to create a focal point for our students, our faculty, to meet with these folks, work with them, learn from them, and share their experiences and ideas with them so that they can really help motivate and take us to that next level," Sanberg said. One place the institute members interact with students is in a class that was launched last year. “Get Innovative: The Habits of Mind that Foster Creativity” puts the experts in front of USF Honors College students, where they share their own stories about their creative process, and the psychology of creative thinking. Selim Chacour, principal founder of American Hydro Corporation, talks to the class about how his company became an industry leader in hydro turbines. Among the institute faculty who’ve stopped by the class this semester are Richard Berman, who was the interim dean of the Patel College of Global Sustainability at the time of his visit; American Hydro Corporation founder Selim Chacour; and Donald Keck. Keck’s name may not be familiar, but you probably know what the former researcher and executive for Corning Incorporated helped perfect – optical fiber good enough to use in telecommunications. That creation basically enabled the internet to come into being. 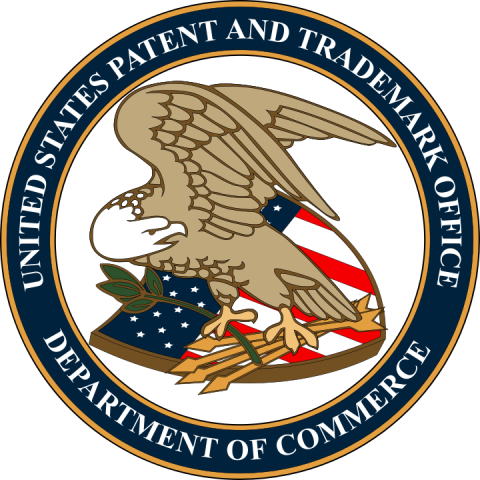 Keck says it took him and his colleagues a dozen years to get their innovation to market. Now he wants to share those difficulties with students so their creative paths aren’t as challenging. "So we try and pass those on to the students so that they can maybe short-circuit, get to the end result quicker on some of their ideas if they’ve seen some of the things where we’ve succeeded and yes, where we’ve failed as we tried to get things into place," Keck said. Sophomore computer science major Abdul Munim Zahid likes that the class allows these experts to show that they’re very much human. "We can all go to YouTube and watch a bunch of videos about innovators, but to get the personal feeling that we get in these classes, it helps you realize that these people are also very normal people just like us, they were once students, they all went through the same journey as us, and now they have accomplished so much, it makes you believe even more," Zahid said. In addition to the class presentations, the students conduct out-of-class, one-on-one interviews with the institute faculty. "I think it is an amazing opportunity, I definitely would not trade it for anything else," chemical engineering junior Rebecca Haskins said. "Because where else would you go to, every single week, meet with people that are so profound and have accomplished so much in their lives?" Like many courses in the USF Honors College, students come from a variety of majors. "When you go into a certain major, a lot of the times you’ll have a way of looking at issues that other majors may not have," Michael Gile, an environmental science and policy senior said. "So then when majors interact with each other, they share those perspectives." But what makes the “Get Innovative” course unique is that a trio of professors from a variety of disciplines teach it. Dr. Kimberly Macuare is an English instructor as well as the Institute’s manager. Dr. Michael Cross, who has a background in both business and physics, is interim director for USF’s Office for Undergraduate Research. And Dr. Sarah Kiefer is the program coordinator for educational psychology. "It just brings a sense of richness to the class, right?" Kiefer said. "It’s just really challenging for one instructor to tackle all those perspectives, but then we’re also able to model best practices as well." Macuare adds that both the institute and the class have the same message in mind – innovation comes when a problem needs a solution – no matter who it’s coming from. "That’s something that we can teach across the disciplines and that’s something that the students realize, that it doesn’t matter if I’m an engineer, it doesn’t matter if I’m in English, that if we can come at the problem, focus on it, find different solutions, then we’re going to get innovative answers," she said. There are plans for expansion, including sections for students across the university as well as discipline-specific and graduate level versions of the course.